Trojan's L16RE-2V Renewable Energy(RE Series) batteries are specifically designed for renewable energy applications such as solar/photovoltaic, small wind, and micro hydro. The L16RE is available in 2-volt and 6-volt sizes and offers brand new features and benefits unmatched in the industry. Specially designed deep-cycle cells are much less susceptible to degradation due to cycling and are required for applications where the batteries are regularly discharged, such as photovoltaic systems, electric vehicles (forklift, golf cart, electric cars and other) and uninterrupted power supplies. These batteries have thicker plates that can deliver less peak current, but can withstand frequent discharging. Built to deliver superior performance, durability and reliability, Trojan batteries are dependable for consistent performance in any application - whether it's for energy saving grid-tie system or off-grid power in remote locations. Trojans DuraGrid Technology is a grid design specifically engineered for the longer life requirements of renewable energy applications. DuraGrid features a thicker grid structure maintaining even greater corrosion resistance effectively increasing the life of the battery for up to 10 years. Trojans DuraGrid Technology combined with the Maxguard XL separator offers excellent charge efficiency allowing the batteries to charge quickly throughout the life of the battery. In renewable energy applications batteries may go days without a charge and they frequently operate at partial Cutawaystates of charge. Recognizing the rigorous use of batteries in renewable energy applications, Trojan incorporated the Maxguard XL advanced separator into its battery design. Exclusively available in Trojans Premium and Industrial lines of batteries, the Maxguard XL separator is 30 percent thicker than our T2 flooded battery separator. The Maxguard XL provides even greater resistance to stratification, which is typically a mode of failure in batteries used in renewable energy systems. Trojans Alpha Plus Paste is a proprietary, high-density paste formulation precisely engineered to deliver outstanding battery performance. This high-density paste optimizes porosity development in the active material utilizing the active material more effectively resulting in sustained battery performance over a longer period of time. Trojans T2 Technology features a patent-pending T2 metal agent which is incorporated into Trojans Alpha Plus Paste further strengthening the electrochemical processing capabilities of Alpha Plus Paste. Together Alpha Plus Paste with T2 Technology increase both sustained capacity and total overall ampere-hours resulting in more operating power for your application. Its a key reason why Trojan batteries consistently. 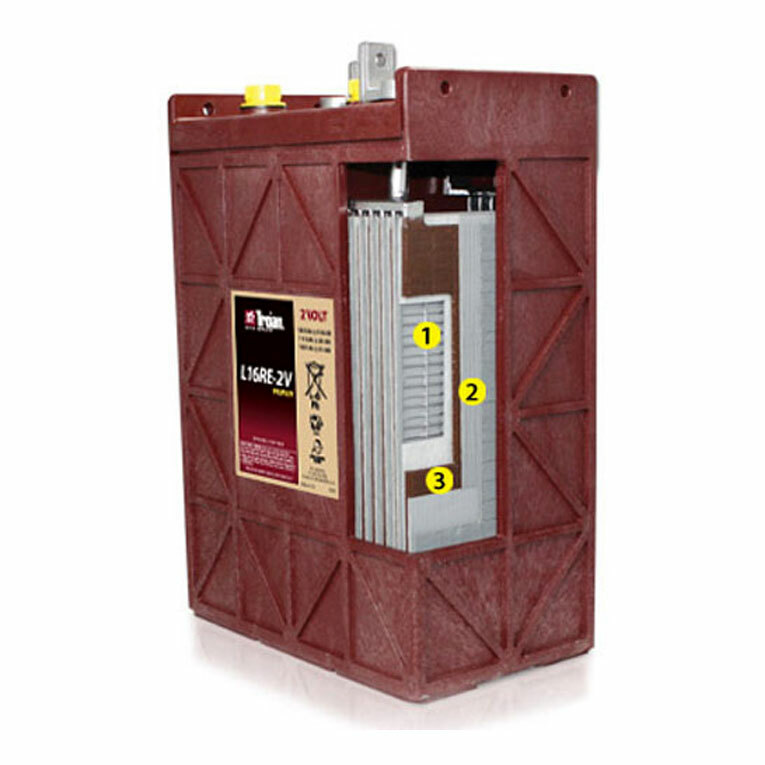 *Flooded lead-acid batteries ship via UPS Domestic Freight within the Continental U.S. ONLY. *NV 8.1% State Sales Tax Apply. Disclaimer: End use consumer is responsible for appropriate sales or use tax. Call Toll Free (800) 515-2423 for details. Need more Trojan L16RE-2V? We offer great discounts on quantity orders and FREE SHIPPING offers are available.